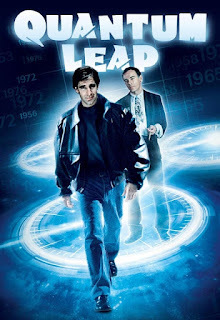 Quantum Leap was a science-fiction TV series that aired on NBC for five seasons, from March 1989 through May 1993. The origin of the series is credited to Donald P. Bellisario and it starred Scott Bakula (NCIS New Orleans, Looking, Men of a Certain Age, Chuck, Star Trek: Enterprise, Murphy Brown) as Dr. Sam Beckett. Dr. Beckett was a physicist who leaps through space-time during an experiment in time travel that went terribly wrong. What was wrong was that when he travels, he ends up taking the place of other people in the time period he leapt to. Dean Stockwell co-stars as Admiral Al Calavicci, Sam's womanizing, cigar-smoking companion and best friend, who appears to him as a hologram via brainwave transmissions, in a constant advisory position. I mean, what else can he do? No one else could see him but Dr. Beckett. The series featured a mix of humor, drama, romance, social commentary, and science fiction as Beckett travelled from one body to the next. In each episode, there was the trademark "Oh boy" as Becket sees who he's leapt into. We watch Sam, while everyone else in the story only sees him as the person he stepped in to. Every time he jumps into a new body Sam tries to figure out what he's supposed to fix so he can move on and after he fixes the issue with this person, he jumps through time again, moving on into another body. Though his hope is that each time he fixes something, it will send him back home. The end of each episode was a cliffhanger, showing his next leap. The final episode of the series hits Sam hard, because he learns that he always had the ability to return home, but the series ends with him continuing to leap, continuing to help people. The series earned an 8.1/10 score on IMDb. Before this show Scott Baukula did theater work and commercials before landing several roles on Broadway. When he got the role in Quantum Leap, he was well prepared for the many characters whose bodies he leaps into. He was able to showcase his singing and dancing, which is quite good and even won a Golden Globe for best actor in 1991. Dean Stockwell had a long career too prior to the show as he started out as a child actor in the mid-40s and is also an accomplished artist and musician. Many loved this show and judging by the IMDb score, many still do. According to Google, the show is still on various outlets, YouTube, Amazon Video, iTunes, Vudu, Google Play Movies and Hulu.